Model Agencies, Talent Houses, Talent Managers, Talent Agencies, Actor Managers and More. The A' Actor, Talent And Model Design Competition is a unique design competition open to submissions by professional model agencies, talent houses, talent and booking agencies, acting agencies, model management companies, music agents and more. This is not a beauty pageant. This competition is intendend for Model, Talent and Actor Agencies and Managers to present their companies. 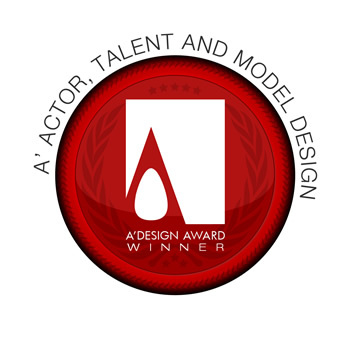 The A' Design Award for Actor, Talent And Model Design is not just an award, it is the indicator of quality and perfection in talent management, the award is recognized worldwide and takes the attention of design oriented companies, models, actors, talents, professionals and interest groups. Winning the A' Award is a certificate of excellence for managers, an important milestone in your career. Having the A' Award attracts the eyes of professionals worldwide, winners will be able to find better and higher profile models, actors and talents. The winners of the Actor, Talent And Model Design Award are provided extensive and exclusive marketing and communication services to promote the success of winning the A' Award. Furthermore, the winning portfolios will appear on the A' best designs book which is available worldwide, this book is furthermore distributed to the high-profile magazine editors, design oriented companies and relevant parties. The winning designs are also exhibited at our museum, and the best designs will be picked for the permanent exhibition. The winners appear on magazines, newspapers, webzines and many other publishing mediums. The best talent, actor and model agents and managers are identified according to how they manage their businesses, how they present their talents, overall form and structure of their businesses. The Aim of the Actor, Talent And Model Design Award is to attract the attention of media and big-players to talent agents by means of creating publicity and dissemination and also to seperate the real agencies from the rest of the actors in the talent industry by honoring them with a prestigious award. To be eligible for this award, you should be a professional Model, Talent or Actor Agent, or Manager. Freelancer models, talents and actors are allowed only when presented by an agency or manager as a part of their portfolio. Only a single entry is allowed each year. The Actor, Talent And Model Design Award, considers the overall structure and presentation of your agency using the portfolio of models, actors or talents registered together with the overall design of your business. Your model, actor and talent portfolio will be evaluated as a whole together with the presentation of the models, actors and talents that you manage. You must submit your porfolio as a pdf, a video demonstration of your agency, and your best 5 talents, actors or models as images. The portfolios of the agencies are judged by our criteria that checks six key points: 1. Originality: Does your portfolio have a unique / individual style with a distinctive corporate vision and language in presentation i.e. are your models, actors, talents are original, unique and different from that of other agencies. 2. Consistency: Do you have a developed style for chosing your talents. 3. Depthness: Are your models, talents and actors all very similar and focused, or do you have a wide range of categories. 4. Innovation: Do you find a new way to present your actors, talents and models? 5. Presentation: The way you present your actors, models and talents and the overall composition of the portfolio. 6. Involvement: What do you provide to your models, actors and talents? Do you provide education, help during agreements? What else do you provide as a manager? etc. As a brief summary, your best designs will be published, you will be provided many PR-Services, and a designer from your studio or you will be invited to our gala nights, your works / or portfolio will be exhibited in our exhibition and you will get your designs published. Furthermore we will provide Design Mediation services in order to connect your agency to other companies. We will actively be searching for prospective clients for your model studio, and we will present your porfolio to these clients only (Your PDF portfolio will not be visible to others, it will only be visible to prospective design buyers who are registered to designmediators.com). Award winners will be able to use a title that matches their nomination category: Such as "Model Design Award Winner". Main Image* 3600 x 3600 pixels JPEG A photograph or visual as of one of the following: 1. Photo of Many Models, Talents or Actors in your agency. 2. Photo of your best Model, Actor or Talent. 3. A Flyer / Poster of your agency. Optional Image #1 1800 x 1800 pixels JPEG Photo of your Model, Actor or Talent during performance, casting or production. Optional Image #2 1800 x 1800 pixels JPEG Photo of your Model, Actor or Talent during performance, casting or production. Optional Image #3 1800 x 1800 pixels JPEG Photo of your Model, Actor or Talent during performance, casting or production. Optional Image #4 1800 x 1800 pixels JPEG A Photo from your agency, your team. Documentation* Max. 40 x A4 Pages PDF A PDF Document that is composed of 1. A simple portfolio of one of your talents, actors or models together with the composite card, headshot. 2. Your portfolio of talents, actors or models. This information will not be available online. 3. List of services provided to your talents. Video File Max. 10 MB. 45 Sec. AVI A video presentation of your your agency or your portfolio. This will be available online.